The land that Lawrence of Arabia owned and camped on. 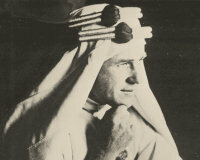 Description: Lieutenant-Colonel Thomas Edward Lawrence, or Lawrence of Arabia, was a famous writer, scholar and soldier. He owned 18 acres of land here until he gave it to the council to protect. He frequently camped here with his friend Vyvyan Richards, a teacher at Bancroft's School who lived in a hut here called Cloisters. Together they planned to build a house on the site and print fine books. He died in 1935 aged just 46 in a motorcycle accident in Dorset.